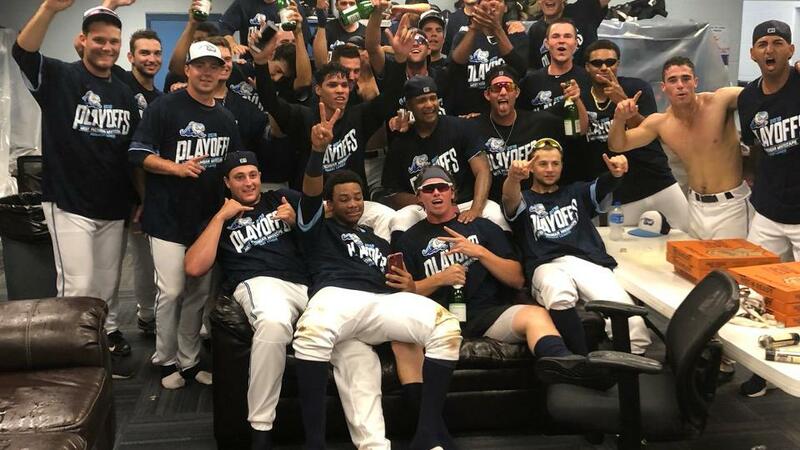 COMSTOCK PARK, MI - The West Michigan Whitecaps punched their ticket to the 2018 Midwest League playoffs, walking off in the tenth inning and earning a 3-2 victory over the Fort Wayne TinCaps in front of 4,624 elated fans on Labor Day afternoon at Fifth Third Ballpark. In a "winner-take-all," season finale, with the victor going to the playoffs, Colby Bortles laced a bases-loaded RBI-single up the middle to tie the game followed by an Anthony Pereira sacrifice fly to center which scored Brady Policelli and sent the 'Caps to their fifth straight playoff appearance. The TinCaps struck for a run in the first inning as Gabriel Arias grounded an infield single and the ensuing throw to first by the 'Caps shortstop Wenceel Perez airmailed Jordan Pearce at first base, enabling Jack Suwinski to score from second base. In the second, the 'Caps Jordan Pearce struck out looking and ejected from the game by home plate umpire Alex Nash, the first Whitecap player to be tossed from a game in 2018. Anthony Pereira replaced Pearce at first base for the remainder of the contest. Meanwhile, the 'Caps managed to put men in scoring position in four of the first five innings against TinCaps starter Tom Cosgrove but failed to convert before Joey Morgan, who came on as a pinch hitter in the seventh inning, pounded an RBI groundout, allowing Rey Rivera to score from third and to knot the game at one. The game moved to extra innings with the TinCaps plating a go-ahead run in the top of the tenth and taking the lead back at 2-1. The Whitecaps utilized their sense of urgency in their tenth inning by loading the bases. Colby Bortles tied the contest with an RBI-single up the middle. Anthony Pereira proved to be the hero with a game-winning sacrifice fly to center, scoring Brady Policelli, and sending the 'Caps to a 3-2 win and a trip to the playoffs against Great Lakes on Wednesday night. The walk-off winner represents only the second time in 65 games in 2018 in which the Whitecaps scored in their last at-bat when trailing in the contest. Whitecaps starter Jesus Rodriguez paced an outstanding Whitecaps pitching performance, tossing five innings of one-run baseball while only allowing four hits in receiving the no-decision. Mitchell Stalsberg dished three innings in relief for West Michigan, allowing no runs on one hit while striking out two. Johan Belisario (3-2) picked up the win two innings of one-hit baseball. Fort Wayne reliever Evan Miller (5-6) surrendered the winning run and absorbed the loss. West Michigan finishes the regular season at 69-70 while Fort Wayne dips to 33-36 in 2018. The Whitecaps take on the Great Lakes Loons in the first round of the 2018 playoffs starting Wednesday at 7:05 pm at Fifth Third Ballpark. Pitcher Brad Bass is scheduled to start for West Michigan against Great Lakes righty Gerardo Carrillo. Broadcast coverage with Dan Hasty begins on the Whitecaps Baseball Network at 6:55 pm. Tickets are available for any Whitecaps 2018 home contest by calling the Whitecaps front office at 616-784-4131 or by visiting www.whitecapsbaseball.com.